Stand apart from the competition. Check out our latest project and newest listing for sale! Please pardon our appearance as we continue to add and improve our website. You can connect with us through our social links at the bottom of the site. Keep more of your investment; stage your home to sell! If you’re thinking of selling your home ask yourself this: How can I increase the selling potential of my home? The answer is in home staging! By adding staging to your home’s marketing, your home can sell 30-50% faster than its non-staged counterparts. Imagine yourself walking into your dream space and realizing that it is in YOUR own home! What’s even better? You don’t have to wait a lifetime to have it. You can kick back and relax in a newly transformed room - all done in a matter of hours and at a fraction of a decorator’s cost. This is a valuable service that addresses multiple needs. Whether you have a vacant home to sell or are looking to change the look of your home, this tool is meant to help homeowners visualize the potential of any given space. In the case of a vacant property, this provides the visual that transforms the house into a home. Beautiful 4 Bedroom, 3 bath traditional home is nestled on a third acre lot and framed by lush oaks and mature landscaping. Designed for entertaining, this home features formal dining and living areas with ceramic tile floors and crown molding. Photos by dArt Daal. Open Floor Plan With 3 Bedrooms 2 Baths, Huge Living Room Area With Rich Wood Laminate Flooring And A Huge Master Bedroom And Master Bath That Include Dual Sinks, Garden Tub And Separate Shower Stall As Well As A Private Water Closet. Beautiful 3 bedroom/2 bath pool home in the desirable Woodlands Community of Longwood. This bright, open and spacious home is ideal for entertaining with its mature landscaping, large fenced yard, open patio area, outdoor gas grill and in-ground pool. Includes a formal living/dining, family room, and wood laminate flooring. Beautifully remodeled Mid-Century Modern Mansard style pool home located in the highly sought out SWEETWATER OAKS Community! Uniquely designed entertainment home has been completely remodeled & sits on a corner lot with view of the pond. This spacious home has a lot of character from its CIRCULAR DRIVEWAY, lush landscaped COURTYARD, beautiful WOOD CURVED STAIRWAY designed for photographic memories, & 400+ SQ FT ROOFTOP DECK! Style Fusion Home Staging staged this beautiful home on Lake Rose in Gotha, FL. The formal living room is a comfortable space with a wood burning fireplace. 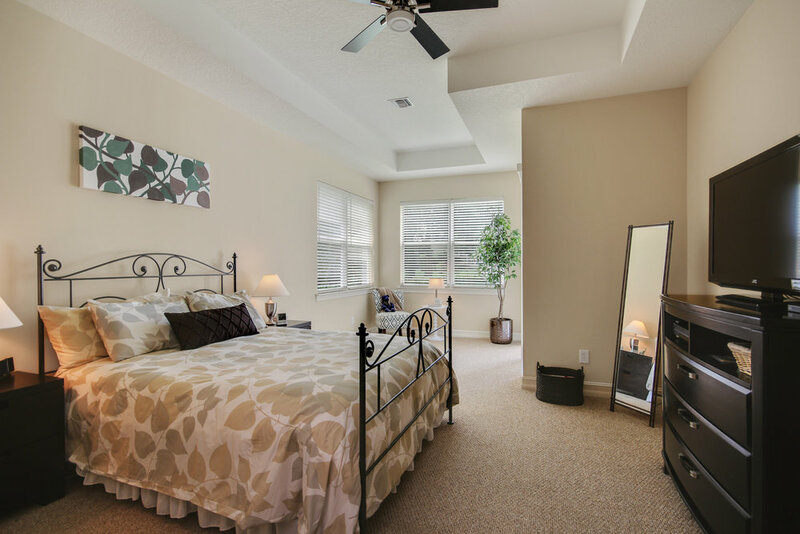 The spacious Master Bedroom and the Master Bath overlook the lake and has a claw foot tub. Nicely updated Kitchen with space to entertain. This home was on the market for several months before being Staged. The most consistent comment was about the functionality of specific rooms and how furniture would be positioned. We staged the home, changing a formal living space into a formal dining room giving it a much needed purpose. The home now had the proper flow and feel that buyers could identify with. The home was under contract one day after being Staged. This large lake front home was vacant and needed some updating to meet the needs of potential buyers. We staged the key areas to maximize the flow of the home and give each room purpose. Many rooms needed a lot of furniture to show just how much space was available. The kitchen got a facelift with new counter tops and a microwave/oven combo unit. This home needed some improvements to make it more to the homeowner's liking. We assisted with material and fixture selections during the improvement phase. It was important to keep to a budget so we used a combination of the homeowner's furniture and some rental furniture to stage the home. Matching the style of furniture was key to keep a cohesive appearance throughout the home. The living room needed defined spaces to accommodate for multiple entry points to maintain an easy flow through the space. This home was under contract in 58 days saving the homeowner over $5,000 in maintenance expenses that would have been paid if it stayed on the market. The average days on the market at the time was 241 days. 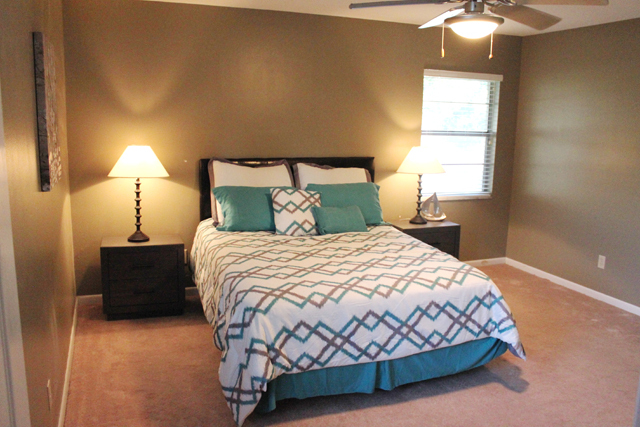 Style Fusion Home Staging staged this beautiful home on Gordon Court in Deland, FL. We worked with the homeowner to build a Staging plan that would fit their budget and time frame. The furniture selection, delivery, and set up took just a few days and ready for listing. In just 4 days the home was under contract for full asking price. Style Fusion Home Staging worked with Prestige Kitchen & Bath to completely renovate a kitchen, half bath, laundry room and office in a home on Saddlehill Road in Deland, FL. We first met with the homeowners, discovered what they wanted their new spaces to look like then created a virtual plan including the materials that they choose along the way. Once the plan was complete, Prestige Kitchen & Bath's team made it all a reality. Style Fusion Home Staging was asked to take a look at an existing home and put together a plan to renovate a large portion of the main floor. We were able to present the main floor as a more open concept showing many paint color and flooring options.